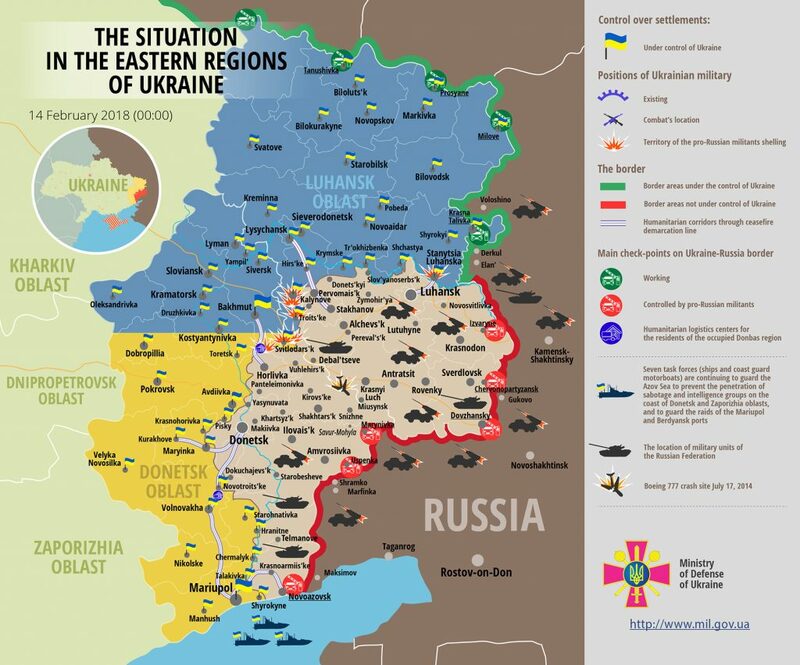 Over the last day, the situation in the combat zone escalated as Russia-backed militants were actively shelling Ukrainian troops’ positions with artillery systems and mortars. Militants fired about ten 122-mm artillery rounds, 187 rounds from 120-mm mortars as well as about thirty 82-mm mortar rounds, reported Ukrainian Ministry of Defense spokesman on ATO Colonel Dmytro Hutsulyak at a press briefing at Ukraine Crisis Media Center. All the attacks took place in Luhansk sector yesterday, where Russian proxies made 14 precision attacks. The most intense hostilities took place near Troitske and Luhanske. Russia-backed militants fired a combined total of 150 rounds from 122-mm artillery and 82-mm and 120-mm mortars in course of a five-hour attack outside Troitske. They also used heavy machine guns, an antiaircraft mount, and grenade launchers. “Ukrainian troops’ in Popasna and Novozvanivka areas came under hostile fire of 82-mm and 120-mm mortars. The enemy also conducted disturbing fire near Maiorsk, Zaitseve, Stanytsia Luhanska and Svitlodarsk using grenade launchers and heavy machine guns,” the ATO spokesperson added. Ukrainian troops returned fire five times using infantry weapons. Fortunately, Ukrainian Armed Force incurred no casualties yesterday. Report on the military developments as of February 13 is available here. Interactive data on the shelling: chronology shelling chart and the interactive map.